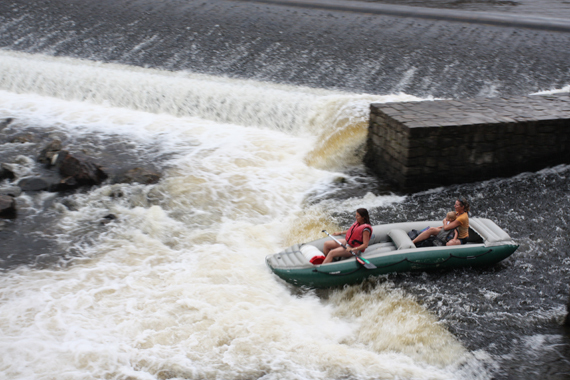 When it’s hot and sunny, kayakers, canoeists and rafters dot the country’s main rivers. 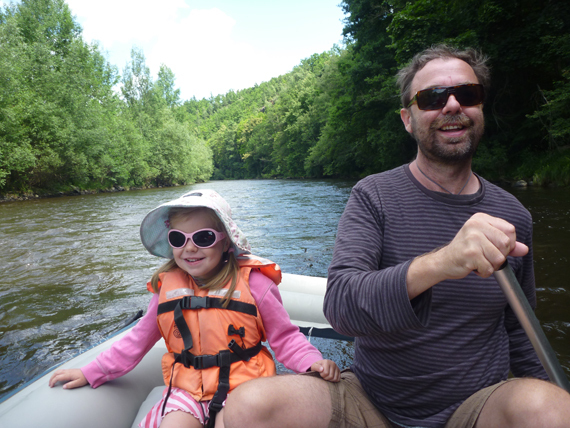 The Vltava, Berounka, Sazava, Luznice, Ohre and Otava rivers are the main spots to hire a boat and experience this wonderful Czech past time. 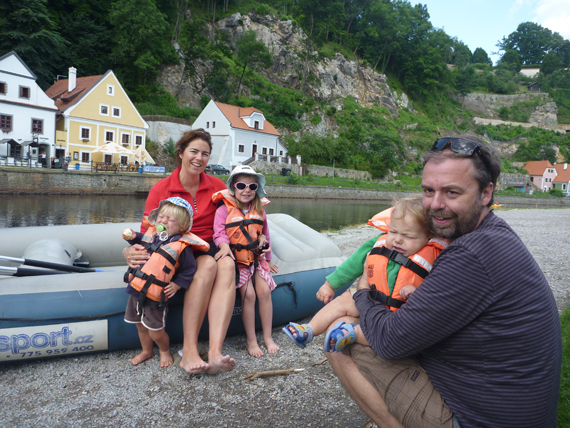 We’ve done quite a few trips on the Vltava, our last trip was with a 13 month old, a 23 month old and a 4 year old so I can wholeheartedly recommend this for children 1 year and above. Our three small vodaci (watermen) were slightly apprehensive at first (check out the photo!). The river was flowing by and my 4 year old knew we would need to tackle the biggest chute within our first few minutes on the water. As we approached the chute she screamed something terrible but we’d lined up the raft nicely and it gracefully raced down the slide and just rocked gently when we hit the foamy water at the bottom. Her screams were replaced with unstoppable laughter mid-way through the slide and she was won over. The key to successfully negotiating the chute is to make sure you rent a raft - those big, rubber family ones - they do not capsize like the plastic canoes and kayaks - all you get is a bit of water on-board. Our raft was for 4 to 6 people, canoes usually only hold 2 people. We chose to rent with a firm we’ve used most times, they transport you to and from your starting and finishing point, supply you with the paddles, waterproof barrels and ensure that everyone, even the smallest child has a life jacket that fits them. We did rent from another hire company a few days earlier and my 23 month old nephew was given an adult sized life jacket - thankfully he did not choose to plunge overboard wearing this oversized jacket. Instead he chose to do this when wearing a child’s jacket a few days later. Thankfully I caught him when he was half way out of the boat! He is a cheeky monkey though, so if you have a hyperactive model toddler, keep a firm eye on them and make sure they sit in front of a fast moving adult! 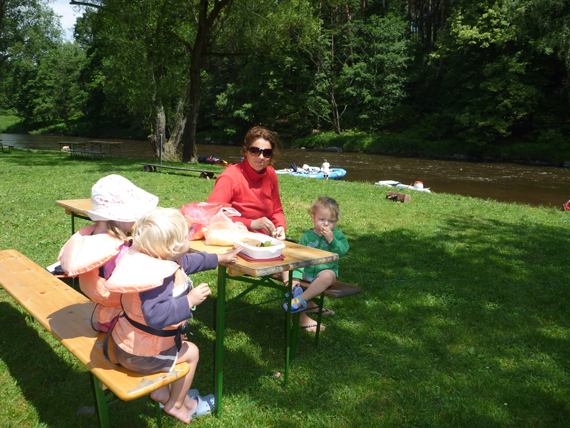 I recommend Cesky Krumlov to Zlata Koruna for smaller kids. The trip is 15 kilometres and takes 3 to 4 hours depending on your speed and how many stops you make. Besides the big chute right at the start, in the town itself, you only encounter 1 or 2 more that are easily negotiated. The start point in town is obviously spectacular, you pass right underneath the second largest castle in CZ, two old bridges and sail past the gorgeous old medieval buildings on the waters edge. Afterwards the river carries you into forested gorges with spectacular rock formations, here you snake around until you emerge at Zlata Koruna - home to a very large, famous monastery. Make sure to stop along the way for the required beer, parek v rohliku (hotdog) and icecream. Various lunch spots and kiosks are found along the river bank offering different kinds of food - you will not go hungry (unless you forget your wallet!). If you are with kids then it’s a good idea to bring some snacks and maybe consider a picnic. Remember sunscreen, hats and water to avoid sunburn and dehydration. The river is so peaceful and you can move downstream with little or no effort at all so you don’t have to have muscular arms or massive fitness to handle the trip. 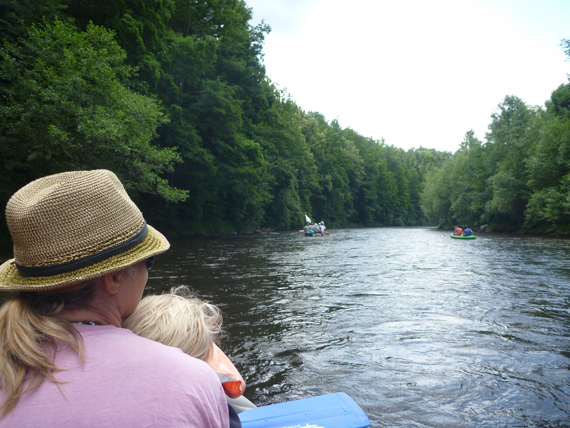 In fact, the river was so peaceful that both boys under 2 years fell asleep and managed their daily nap on board. We’ve found that it can be difficult to book a boat on weekends especially if it’s a long weekend. If you plan a weekend visit then it’s probably best to reserve your boat ahead of time, weekdays should be fine. I do not recommend the river between Rozmberk and Cesky Krumlov, especially around Vetrni it’s a little disappointing - an ugly town with an old paper mill plus you have a fairly busy road running alongside you for most of the way. I’ve been told that the river between Vyssi Brod and Rozmberk is very beautiful so we’ll try this route next time we’re in town (next month, can’t wait!). For more information on Cesky Krumlov - what to do and more importantly where to eat with kids - take a look at this earlier article. 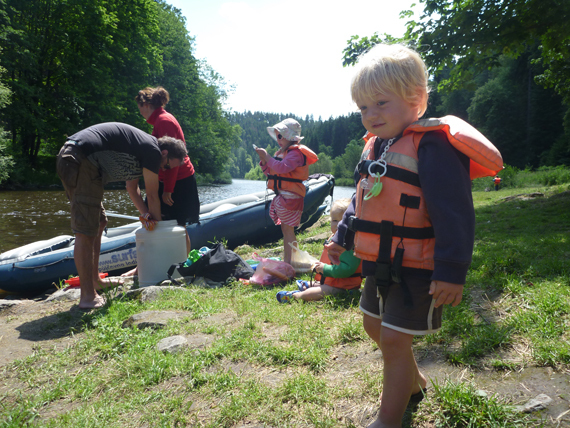 For more information on raft hire on the other major Czech rivers click here. Enjoy, and see you on the water!